Apple shares are lower but little changed ahead of its biggest event of the year. 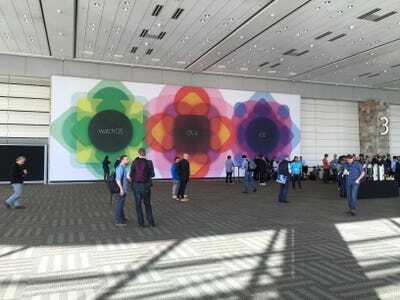 The company is kicking off its annual World Developers Conference (WWDC) in San Francisco. Near 12:45 p.m. ET, the stock was down less than 1%, and had climbed as high as $US129.21 per share in morning trading. The company is expected to unveil its answer to Spotify, software updates for iPhones and iPads, and a new set of tools for Apple Watch developers. Ahead of the event, the stock had slid to the lows of the day. Shares are up 16% year-to-date, and 39% over the past 12 months. You can follow all that’s happening at WWDC on our live blog here, and this post will be updated as the event continues and the stock moves.